There aren’t many places left in the city to get a really good meal while you watch live music. Minton’s, Duane Park and Blue Smoke come to mind, but those joints are small and almost always limited to jazz. I love the B.B. King’s venue. They get a great variety of artists coming in there, ranging from old time blues guys and rock bands, to country stars and rappers. 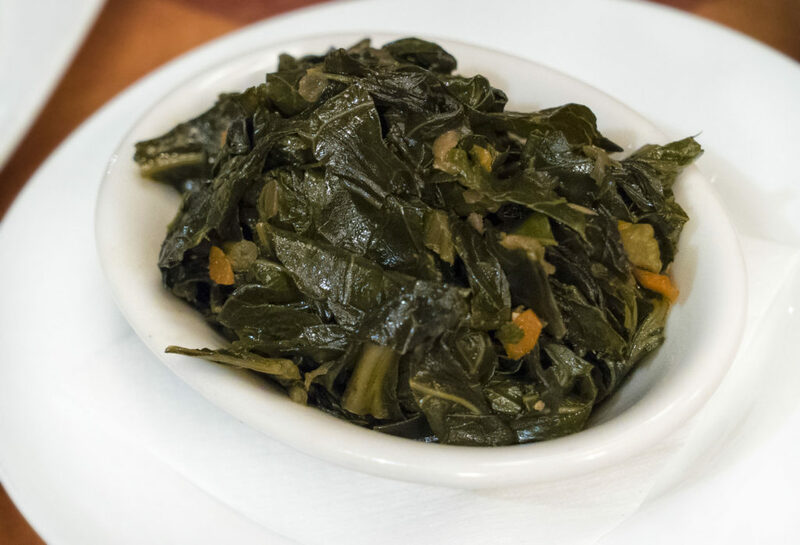 Yeah, they have jazz too, of course, but B.B.’s really has everything – including great food. I had been to B.B. King’s once before to see a show, but I never thought to eat there. In fact I didn’t even realize that the other side of the venue has a nice big restaurant called Lucille’s; I’d only been to the bar and stage side with smaller, less “fine-dining” style tables. So when Chef Wenford Patrick Simpson (Chef Patrick) reached out and invited me in to review and try his food, my interest was piqued. I read up on Chef Patrick, browsed his menu online, and instantly became eager to take him up on his offer and give this place a spin. 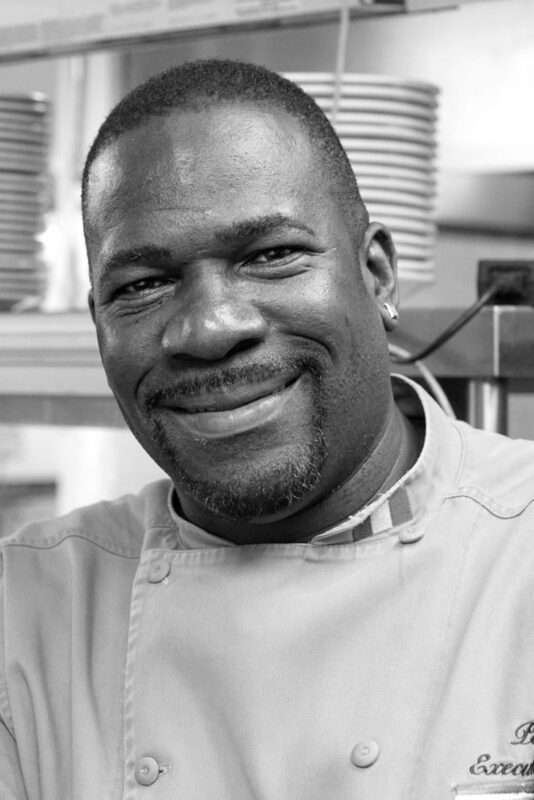 Chef Patrick began cooking as a kid in Jamaica. While attending high school he was offered a job at Club Caribbean, where he was an intern, to begin immediately after graduation. He worked many resorts before taking his skills to the sea on Royal Caribbean and Disney cruise lines. 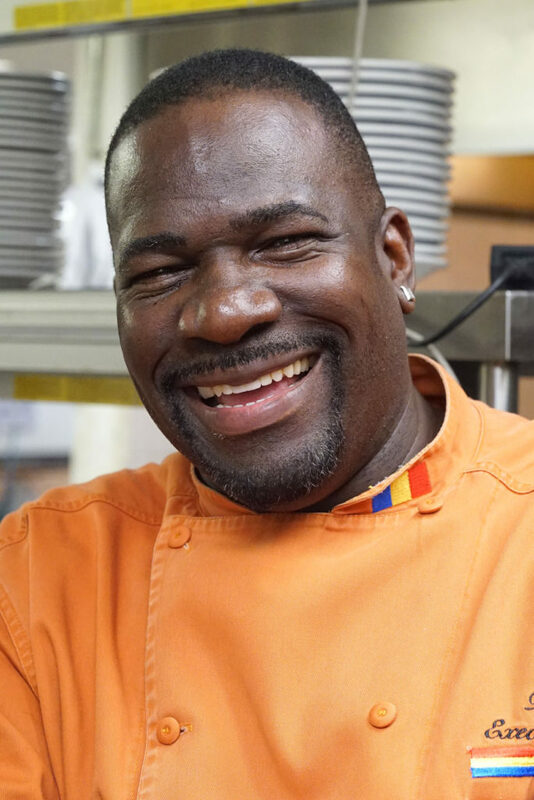 Later, he settled in New York City, where he became Executive Chef at Negril Restaurant. Now, not only is Chef Patrick the Executive Chef for B.B. King Blues Club & Grill, Subrosa and the Highline Ballroom here in NYC, but he’s also the Executive Chef at the Howard Theater in Washington D.C. Wow! I don’t know how he does it all. B.B. King’s alone is crazy. That kitchen gets incredibly busy when both Lucille’s and the main stage room are packed to capacity and the orders are flying in. So what’s next for a man with such an impressive pedigree? He’s launching his own cooking show, called “Cook-Up with Chef Patrick,” on the TEMPO Network – a pan-Caribbean culture and music television channel. 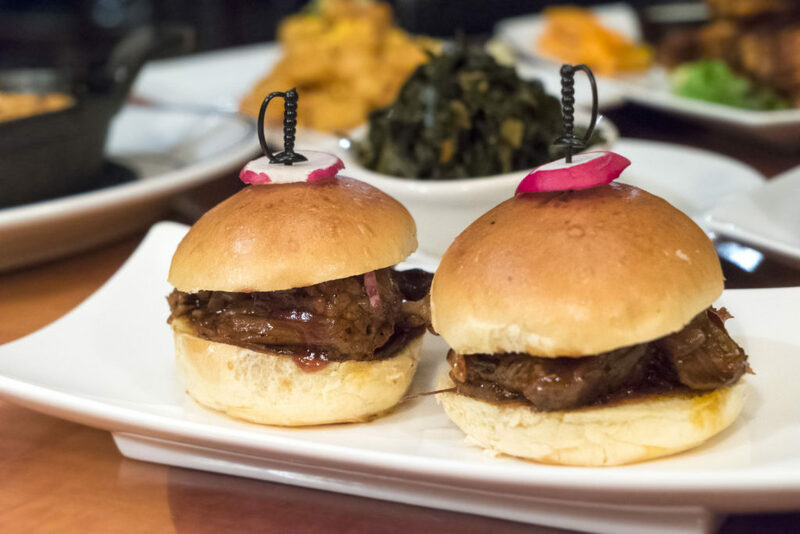 His food has been awarded “Best in Taste” at both Spring Taste NYC, 2015 and Taste of Times Square, 2016. Sometimes he heads to Times Square, Bloomingdale’s and Macy’s to give out tasting samples of his creations. In fact, Bloomingdale’s rated him its favorite chef. It’s easy to understand why. Chef Patrick pushes boundaries in the kitchen. 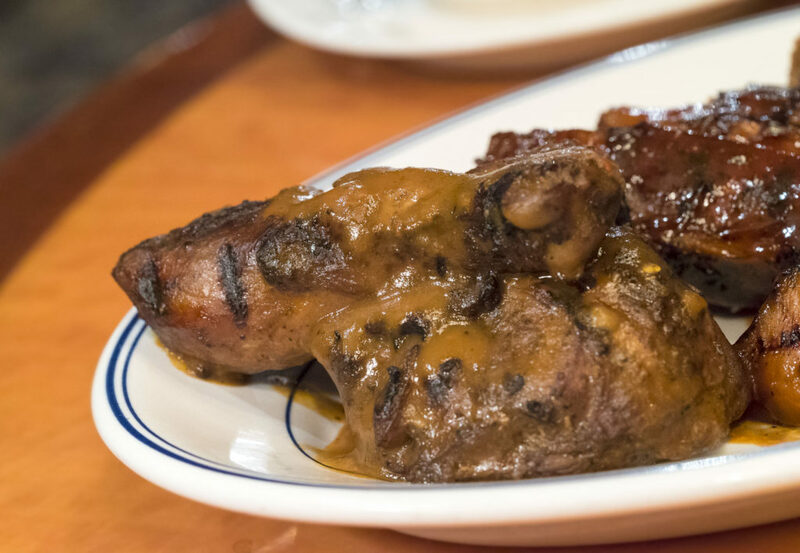 His goal is to create a unique dining experience; he takes Southern and American cooking to the next level with Caribbean spices and flavors. He cooks with love and passion, and his personality is as fun, warm and comforting as the dishes he serves to customers. 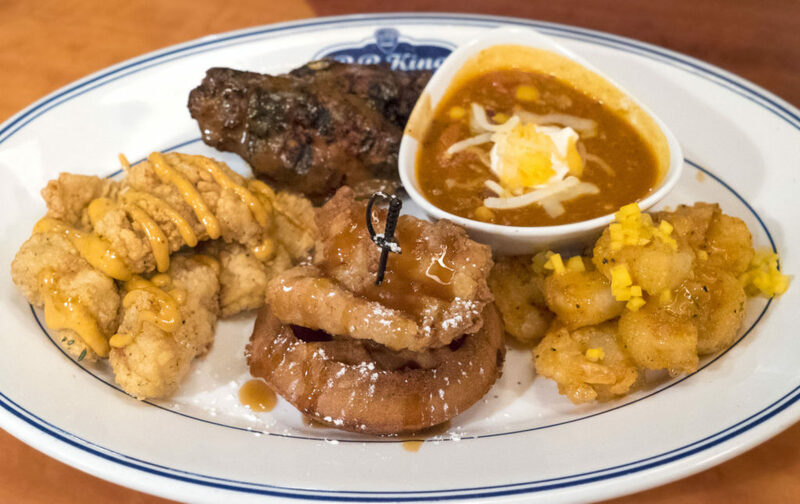 Below is a look at some of those dishes. First, the starters. Chef Patrick brought out a sampler for us to try, along with some of the full sized plated versions of each. 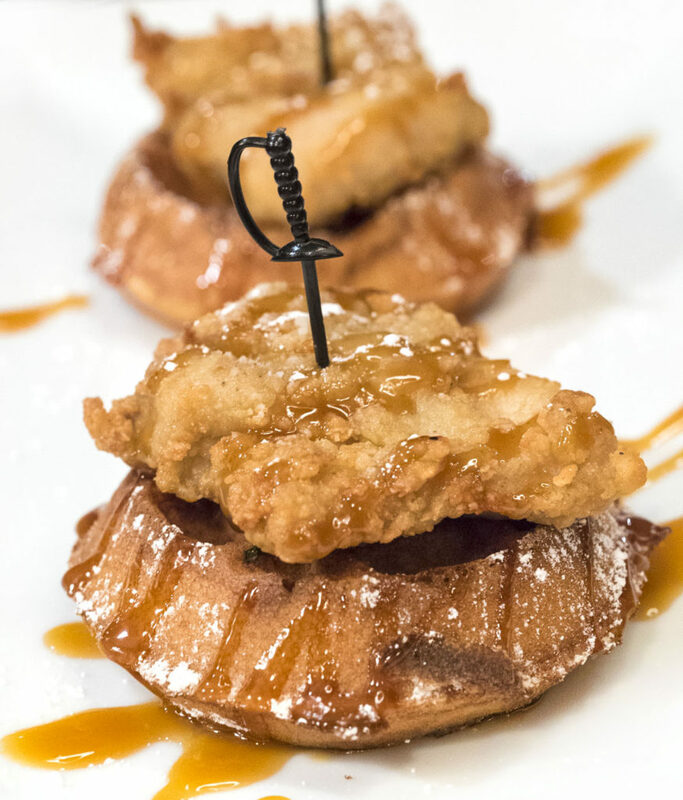 Let me start with front and center: mini chicken and waffles. These things are delicious. 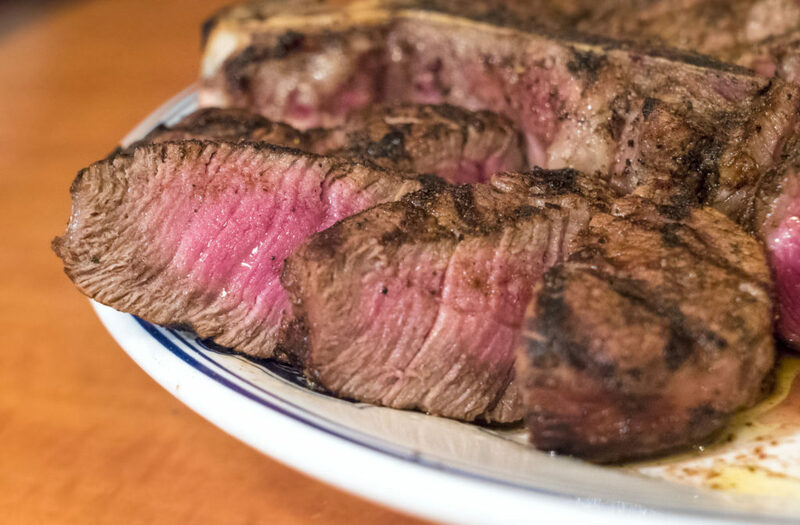 Savory, sweet, fresh, crisp, tender and juicy. 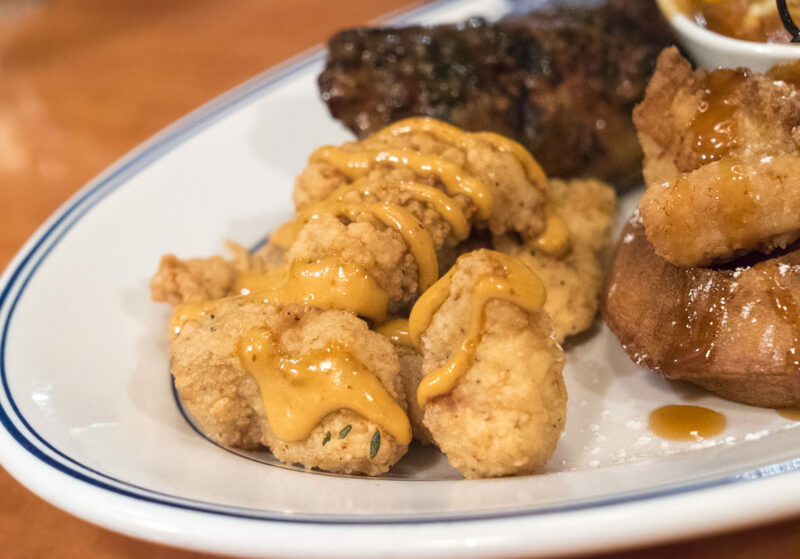 Sweet and spicy fried catfish bites. These were so addicting and flavorful, drizzled with a sweet, spicy and creamy chipotle sauce. 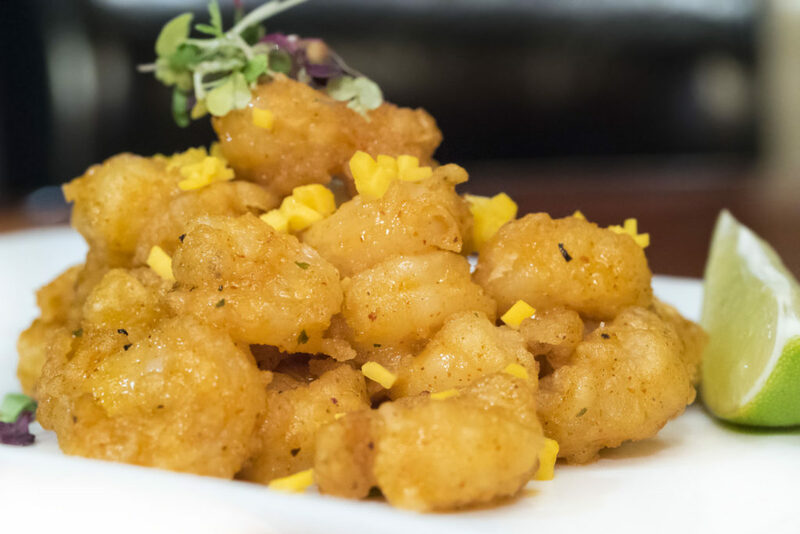 Popcorn shrimp with diced mangoes and a chili and lime sauce. Light, refreshing, and a real pop of flavor with each bite. We tried two different styles of wings. 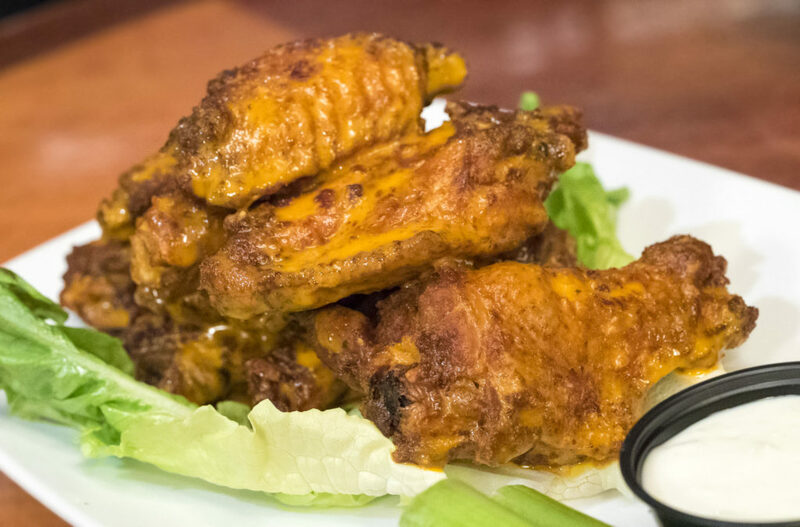 First was a brand new menu addition, the jerk chicken spice wings. These were our favorite between the two. 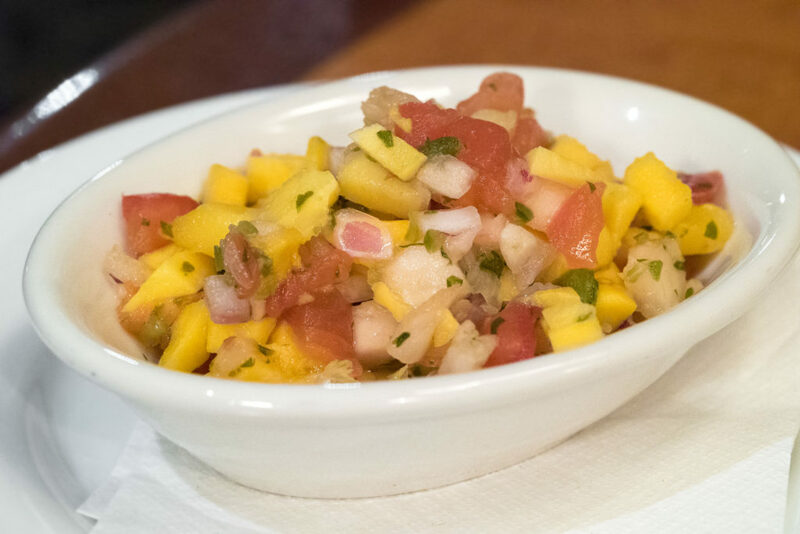 Lots of great bold flavors, and Chef Patrick really brings the flavors of Jamaica to the table. The bluesy BBQ wings were good as well; we just preferred that strong jerk spice flavor. 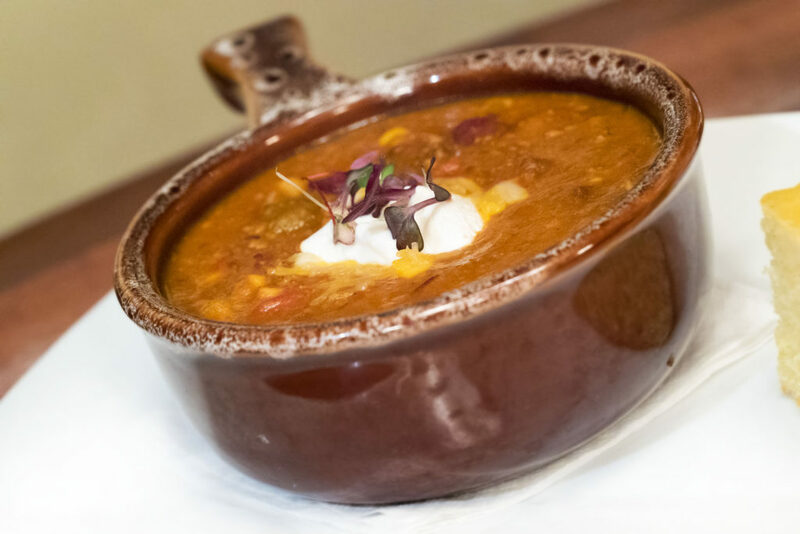 This bowl of chili is thick and hearty enough to eat with a fork! It had an incredible smoky flavor with just the right amount of heat. 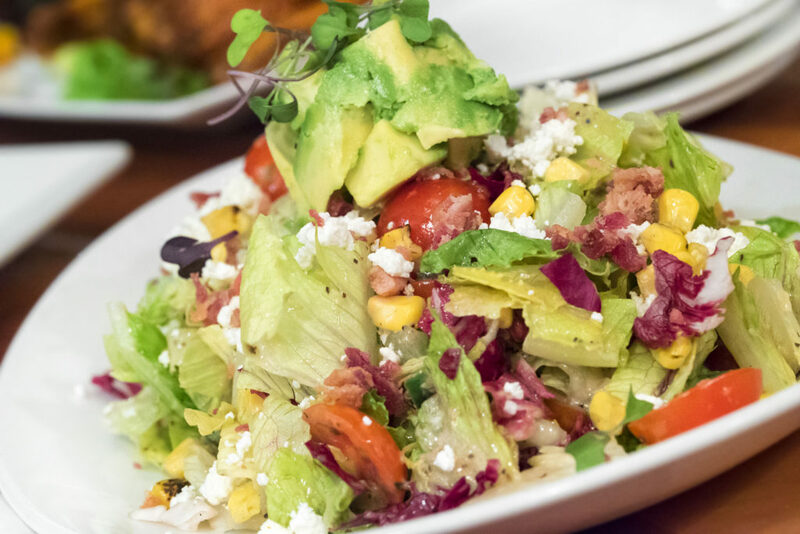 One of their best sellers is this nice, fresh chopped salad, with avocado, corn, bacon, tomato, goat cheese and a light vinaigrette. 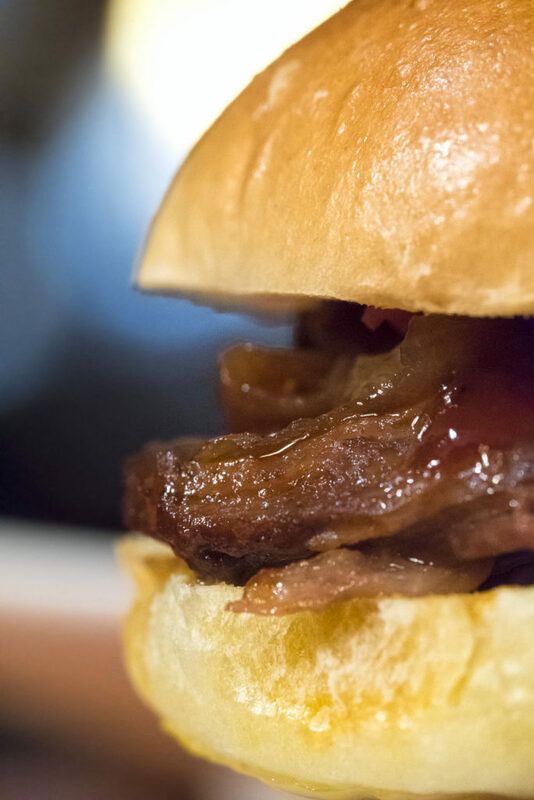 Smoked brisket sliders with Blues Boy BBQ sauce (same sauce as the bluesy wings). These were super tender and delicious. 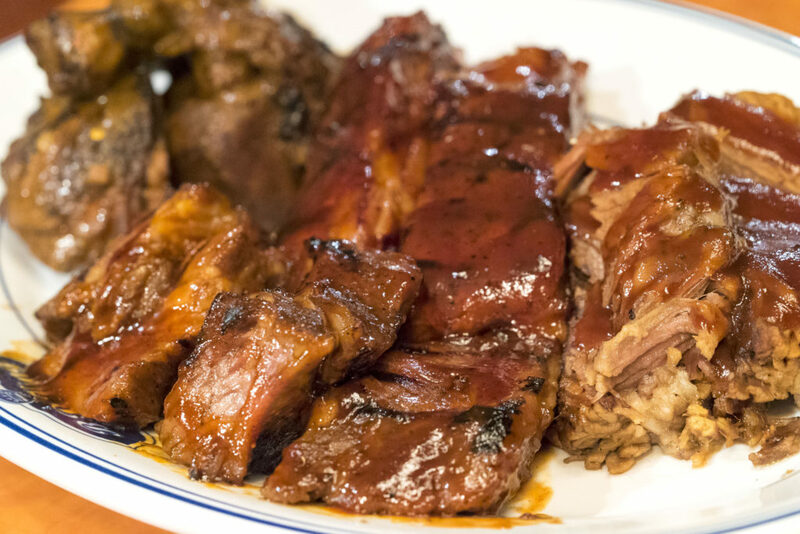 Speaking of brisket, the BBQ brisket here rivals some of the best dedicated BBQ smokehouse joints in town. 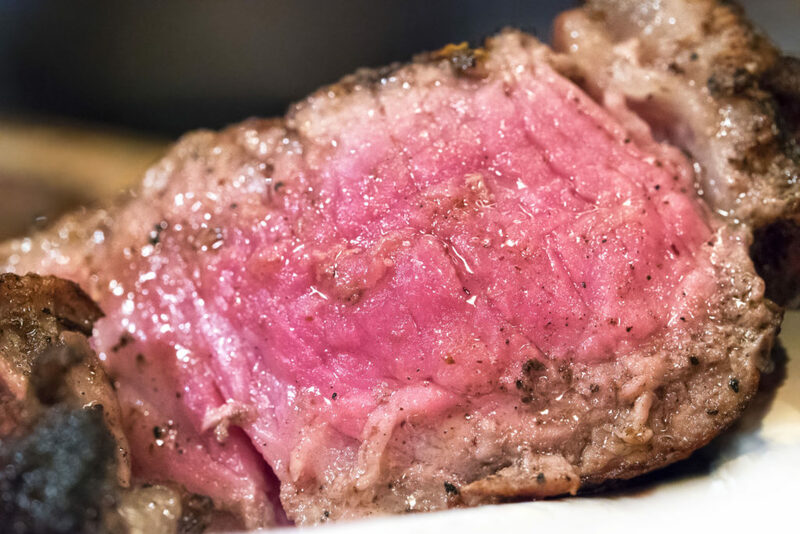 It was incredibly tender and flavorful. 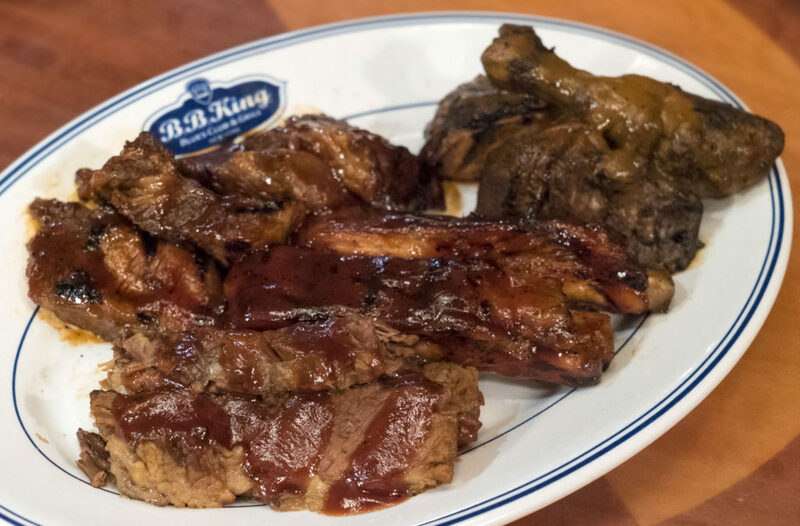 In addition to brisket, Chef Patrick also fired up some amazing short rib, pork ribs and jerk chicken (the latter comes with a mango salsa). 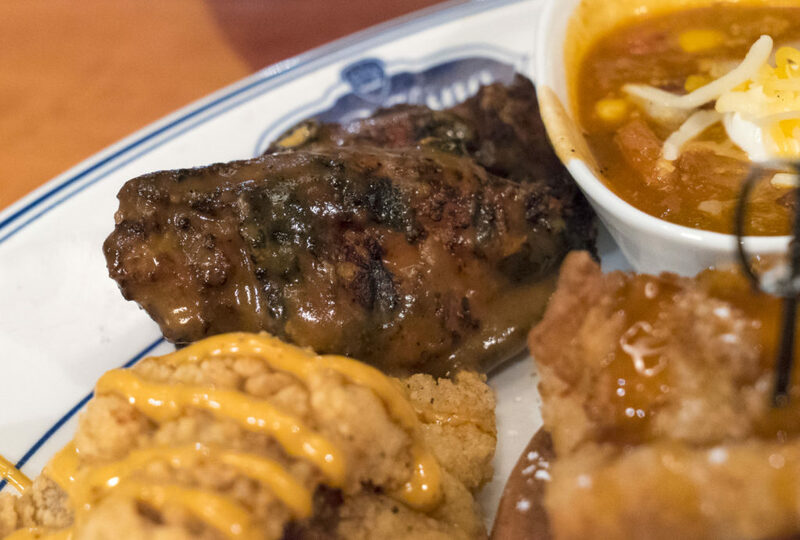 Again, the distinctly Jamaican flavor profile associated with jerk chicken is really killer here. This chicken was slow cooked BBQ style and resulted in super tender and delicious meat. 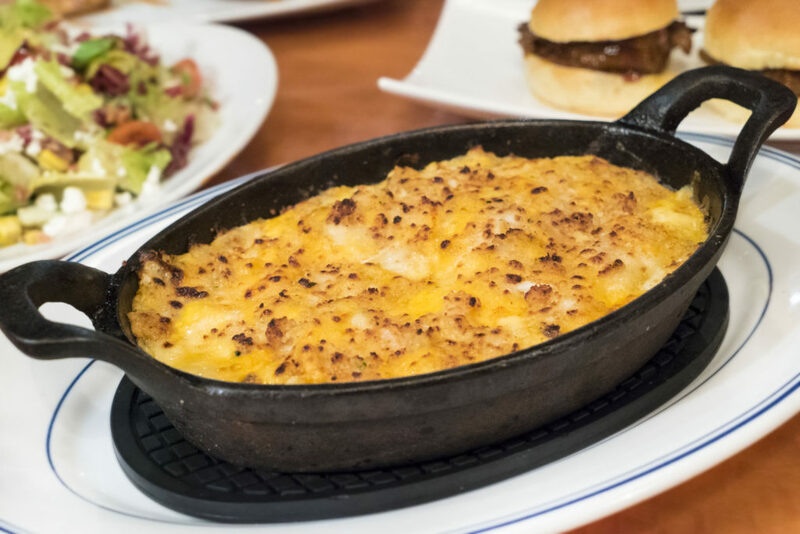 But what southern-inspired meal would be complete without collared greens and a sizzling skillet of mac and cheese? The greens were nicely cooked and had a great freshness and zing to them. 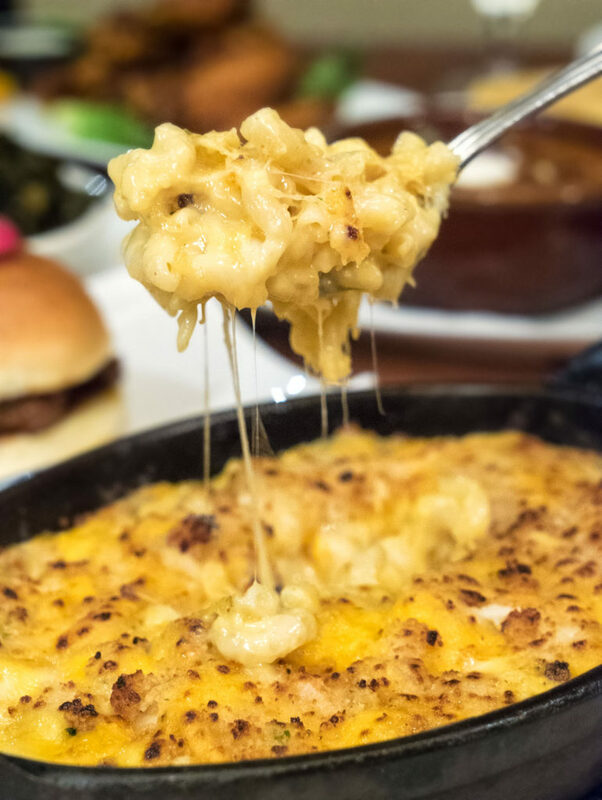 The mac came to the table bubbling, steaming and sizzling, and had a comforting, soul-warming and hearty cheddar flavor. 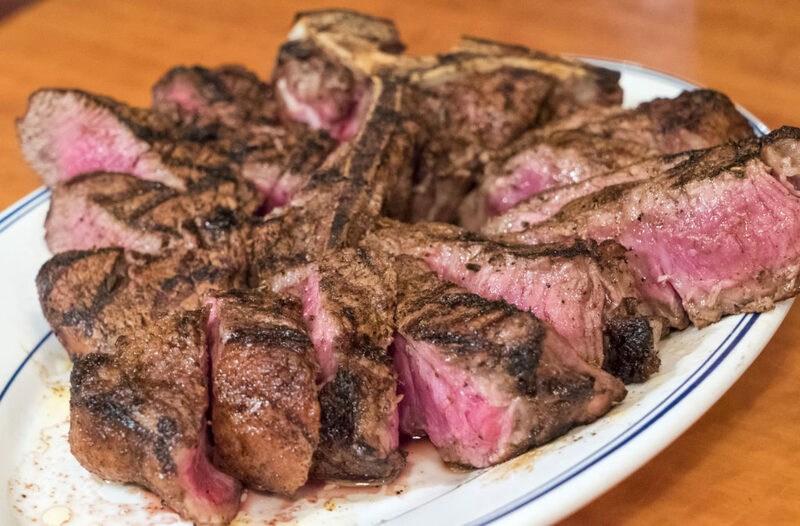 And just when I thought this feast was done, Chef Patrick brought out a gorgeous sliced porterhouse! 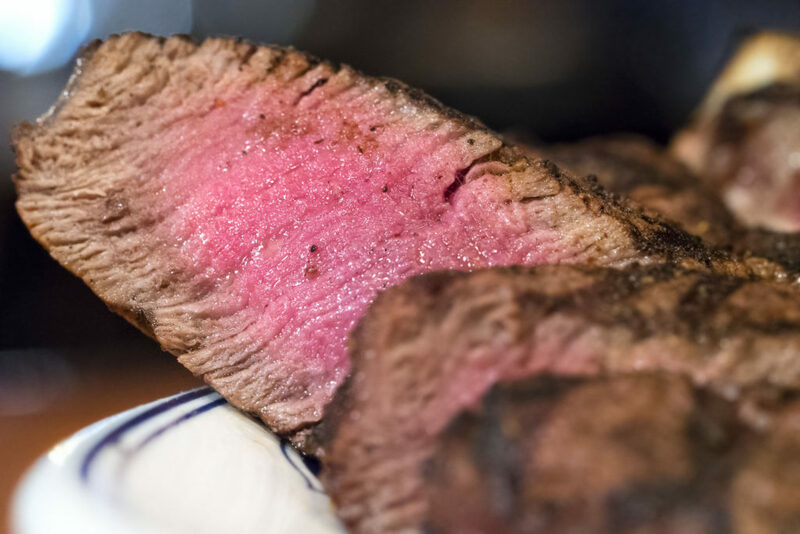 The filet side was super tender and flavorful. I can’t believe I was even able to eat it after all that food, but I guess I have a separate stomach that’s just for steak. It had great flavor and was perfectly cooked. 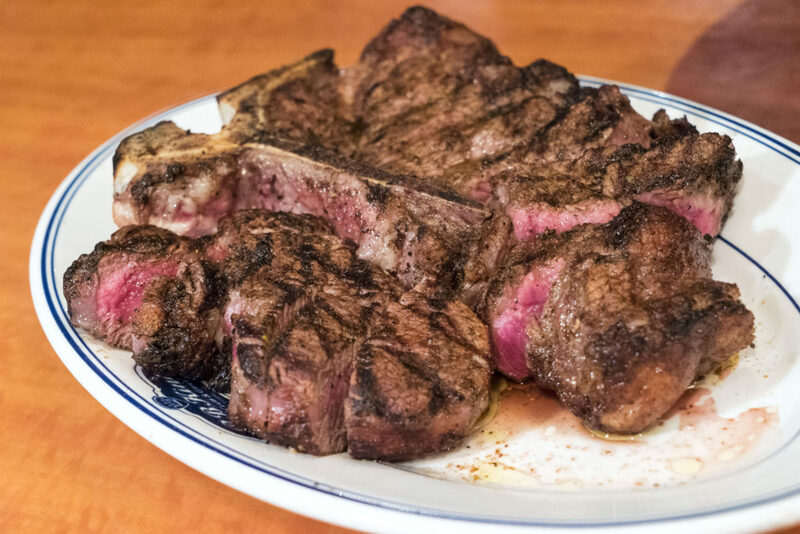 For $80 this is one of the best deals you can find in the city to feed two people with steak. And I’d be a fool not to mention the awesome steak sauce that comes with this baby. 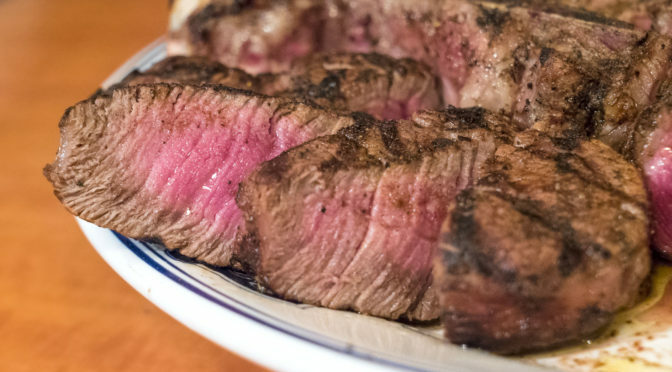 It’s a bourbon steak sauce unlike any I’ve tasted before. I almost never use steak sauce, but this one was outstanding. I’ve actually been poking around the B.B. King’s website looking to buy a bottle of it, but I’ve had no luck yet! 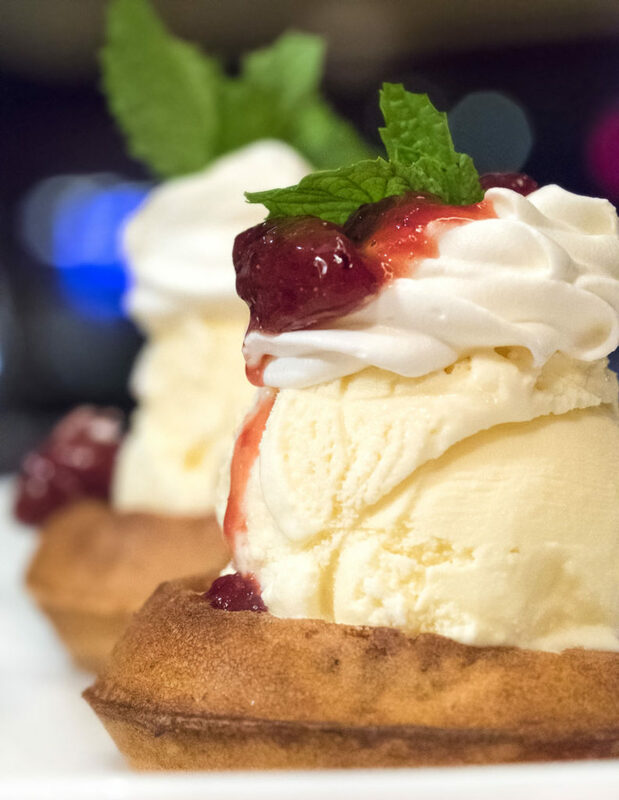 And just as there is a second stomach for steak, there is also a third stomach for dessert. Chef Patrick made what I declared to be one of my favorite desserts in town. 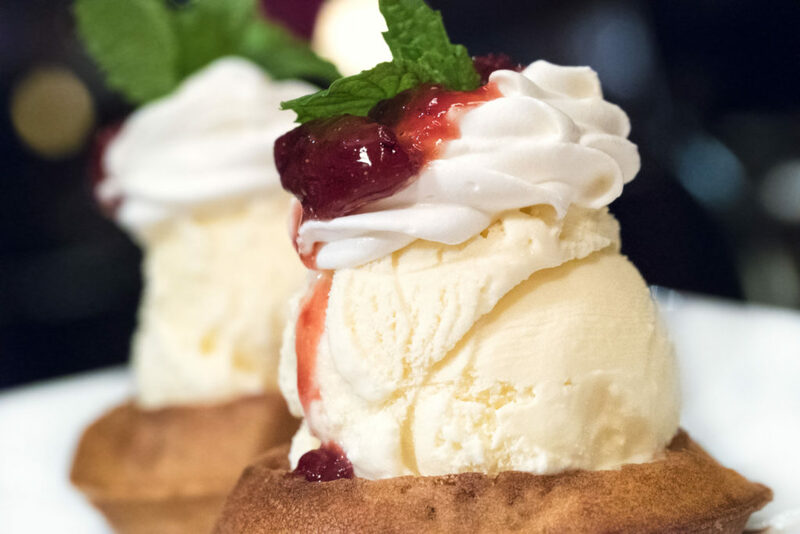 It’s a waffle with ice cream, whipped cream and strawberry sauce – nothing too complicated – but my primary motivation is flavor. This was absolutely delicious. 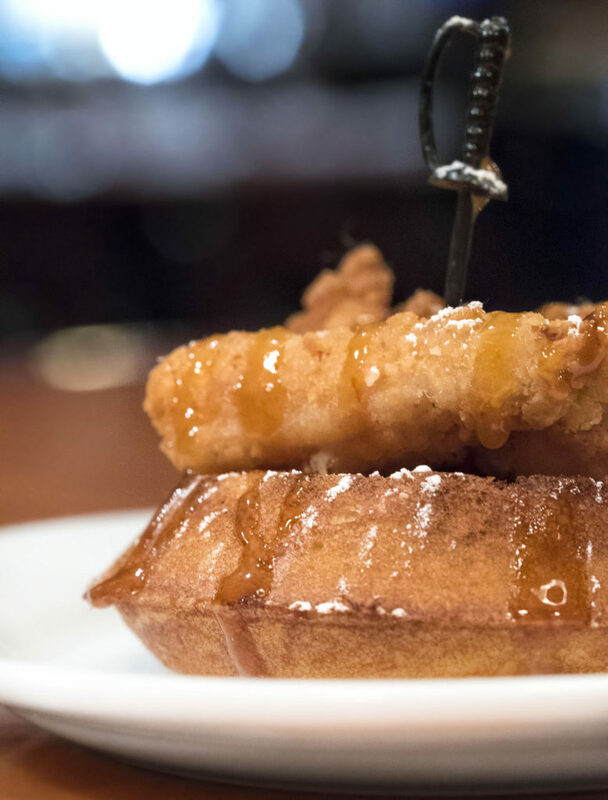 The waffle was crisp and warm on the outside, but soft and tender inside. The ice cream was creamy and smooth, and the strawberry sauce was sweet and tart. Just perfect. I think that covers everything we tried. There’s just one other item that the chef brought over to our table to show us. It was an order for another table, so we didn’t get to try it. 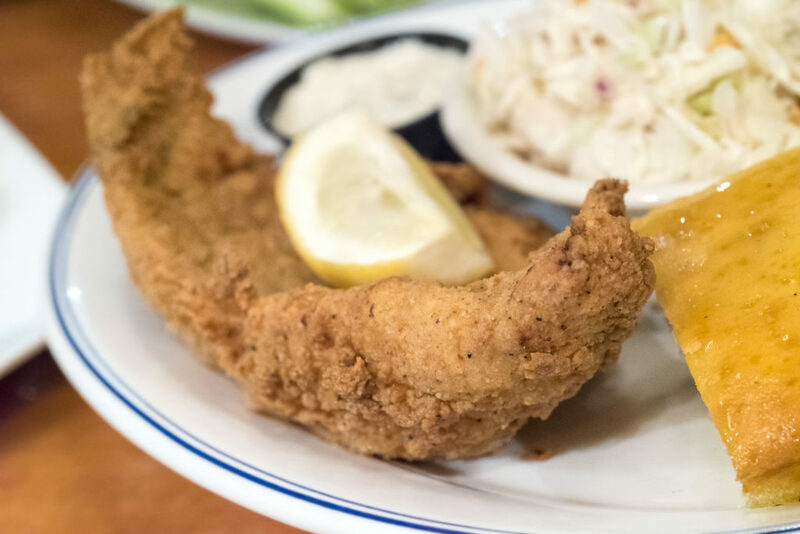 Fried catfish! It looked and smelled great. I guess I will say this in summary: lots of people buy tickets to a performance and they think they need to get food somewhere else beforehand or afterwards. This is not the case with B.B. King’s. 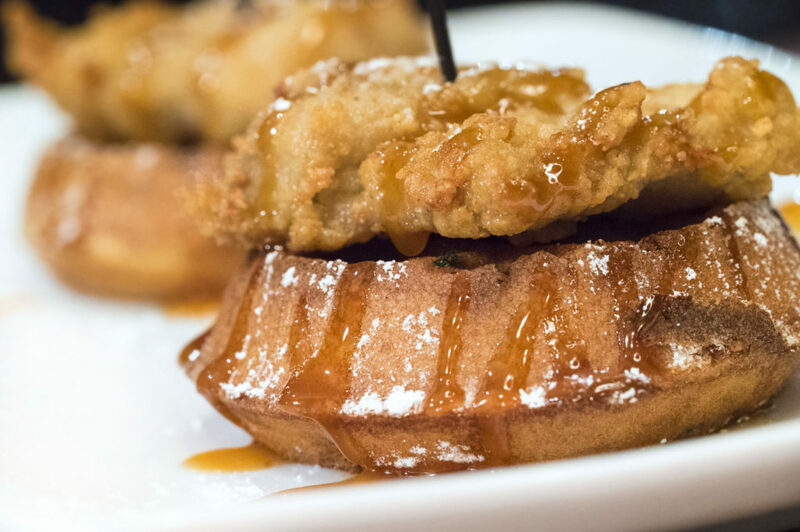 Here, you not only get world class music performances, but you get top notch food to boot.